We love getting emails from developers about their recent apps. (Send to tips[at]mynokiablog or jay[at]mynokiablog to contact me specifically). Here’s an app we’ll be checking out soon but I thought I’d post about it to let you know. My connection is too slow to try anything out right now, but I should be able to test it out for tomo or next week. It sounds like a good app and it’s gotten great reviews at Ovi Store. This translator app doesn’t just translate text, but like to g-translate app, it can also say the translated phrase back to you (in more or less, the correct accent). I was hoping you would find a little app I wrote for the Ovi Store interesting enough to review. It would be an honour to be featured on your site as it’s one of my favourite for news and sometimes, brutally honest, opinion about Nokia and where it’s going. 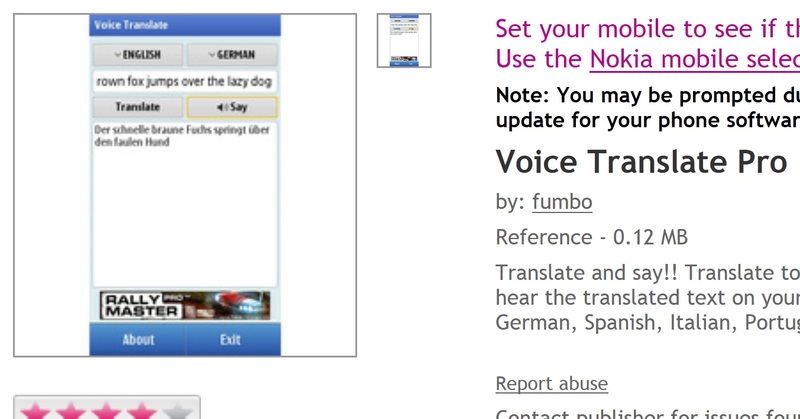 It’s a translation app and uses the Google translate APIs. That’s obviously not that interesting in itself as I’m sure there’s at least a few others. The cool factor comes from the fact that once you’ve translated the text you can have your phone say it back to you, most often with a perfect accent too. With this app you could carry on a conversation with someone in a foreign land without even having to know the language. It’s also great for learning a new language as you not only see the text but have a guide to pronounce the words. download a bloated app. All translation is done online. You can also hear translated text. Perfect for those who are not so confident in a language. Simply press the say button and hold the phone up. Supported languages include French, German, Spanish, Italian, Portuguese, Arabic, Dutch, Greek, Russian and more. Available now on the Ovi Store for all devices supporting Qt – Symbian^3, S60 5th Edition and some S60 3rd Edition devices. « Video: Sneak Peek at the first of the Push N8 films, Long Distance SKATE.